After carefully planning with her team, Patrice now feels fully prepared to create a space where she can share her entire catalog of music, past and present. In her first attempt, intimacy is paramount for her, hence the venue selection. Competing in a male dominated industry has been no easy task for Patrice. However, she has managed to develop a successful career using obstacles and experiences as lessons and guides to further develop herself and craft. The theme ‘Strength of A Woman’ is a representation of Patrice’s growth in the entertainment industry and as a woman. Patrice who is understandably excited about her performance at ‘Strength of a Woman’ understands the involvement of her supporters in her journey; "I feel as though’ I grew up in the public’s eye. In some instances it was obvious that I battled, endured and succeeded” she shares. The concert will also include performances from a number of talented entertainers. 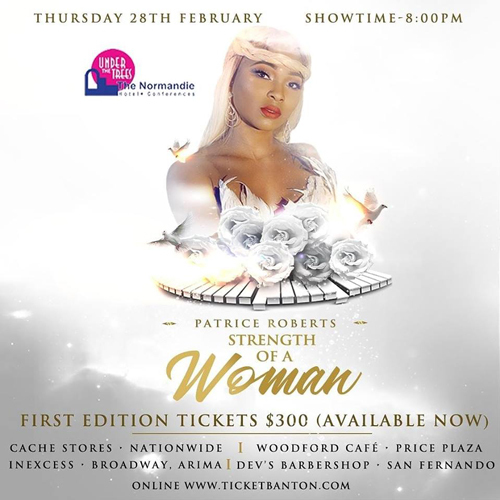 To date Patrice has released her largest catalogue of music directed to Trinidad and Tobago’s 2019 Carnival. Her singles, ‘I like it hot’, ‘This is de place’, ‘Not one thing’, ‘ 10X over’ and ‘Work 4 it’ are some of her contributions that are widely received.